Is anyone else out there obsessed with time-lapse cooking videos? Those thirty second clips that show you how to make anything from Beef Wellington to Mini Strawberry Cobblers (I particularly enjoy with ones produced by the Tasty brand). Parker is obsessed with them as well (mostly because he's not allowed to watch television or videos normally), so when I do stream them he informs me it's a special occasion. Awhile back (pre-Whole30) I came across one such video made by the Alexia brand of foods. They makes these heavenly Sweet Potato Puffs that I would bathe in if I could. If you haven't yet picked them up in the freezer section of your local Target or grocery store, add them to your grocery list. Like now. Anyway, in the video, they use the puffs to form the crust of the quiche. Gen-ius. 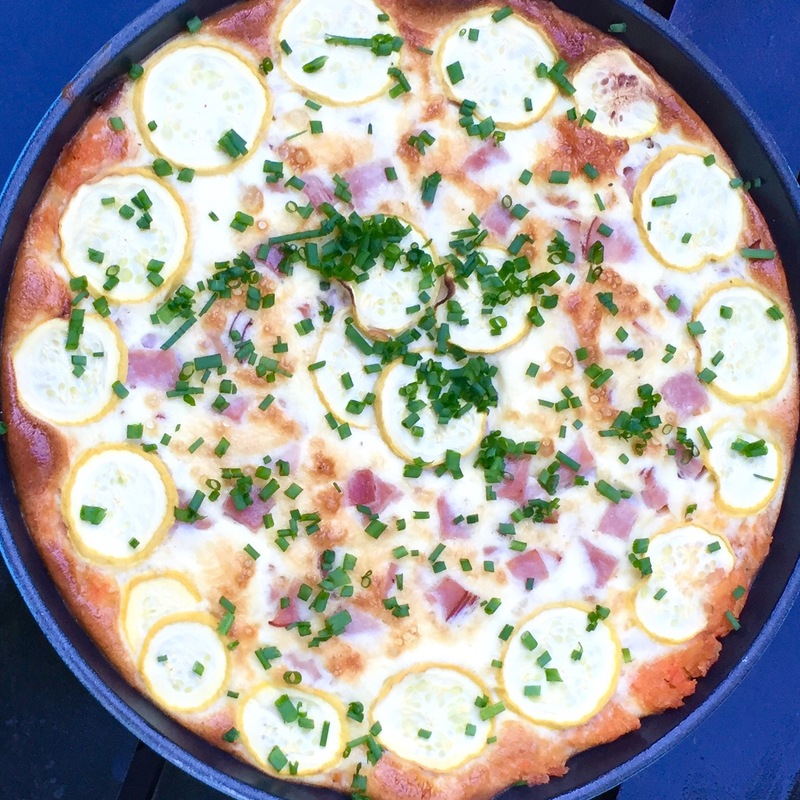 We already had a bag of the puffs in the freezer when I viewed the video, so I whipped up a modified version of the quiche that night, using my beloved Le Creuset Cast Iron Skillet (on sale right now here!). I'm partial to the Caribbean color for all my Le Creusets, mostly because the color reminds me of vacations like this one... to the actual Caribbean! And who wouldn't want to be reminded of that water? Back to the recipe. I didn't have any swiss cheese like it called for, or asparagus. So I swapped out the swiss cheese for a cheddar we had on hand, the asparagus for some CSA summer squash that was on the counter, and my own addition - chunks of ham to make my carnivore of a husby happy. I topped it with chives from the garden, then ended up serving it with some of our CSA arugula (flowers and all!) mixed with champagne vinegar and olive oil. The result? Husby loved the sweet potato crust, and I loved an easy dinner I could prep in 15 minutes! Also, the possibilities of mixing and matching for this are endless!! 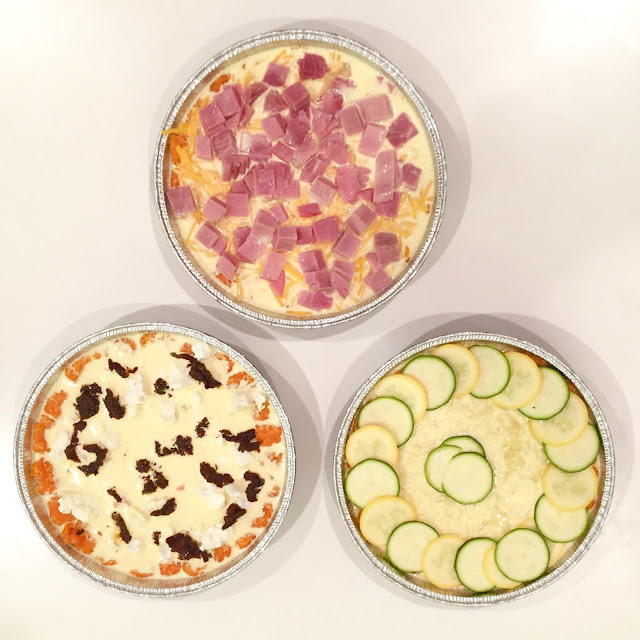 You could easily throw in any cheese and veggie you have on hand and want to use up - a win/win in my book! Preheat oven to 425 degrees F. Grease a 9” oven safe skillet or cast iron pan. 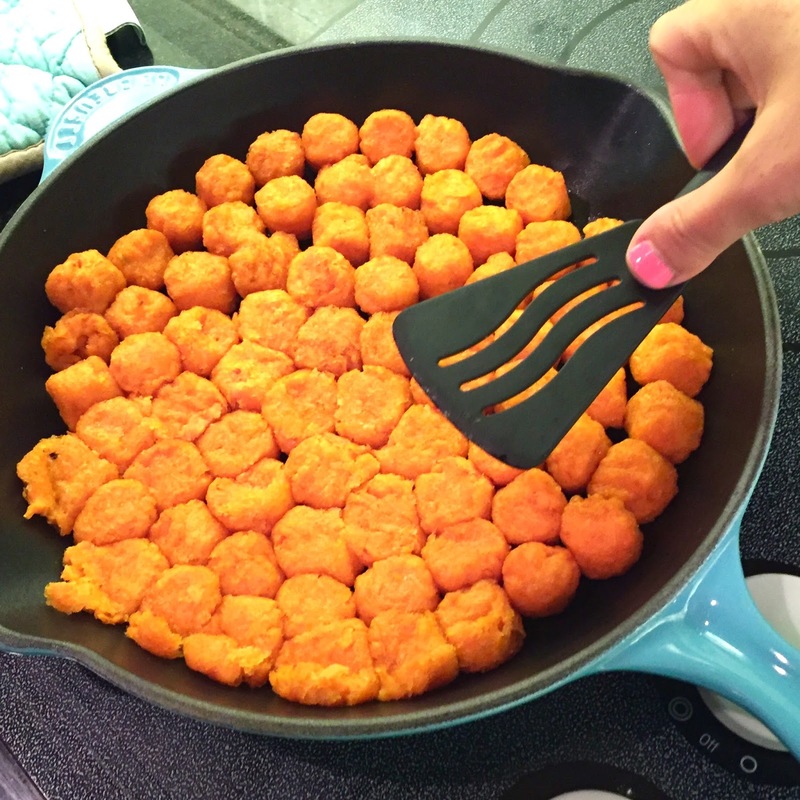 Arrange frozen sweet potato puffs in rings around the bottom of the pan, leaving ¼” space between each puff. Layer an additional ring of puffs around the outside edge of the pan. Place in oven and bake for 10 minutes. Remove from oven and, with a spatula, press tots down into the bottom and sides of the pan to form a crust. While crust is cooking, combine eggs, heavy cream, salt and pepper in a small bowl. Mix well then stir in ham. Spread the cheddar cheese over the bottom of the crust and pour the egg mixture over the top. Arrange squash slices onto top. 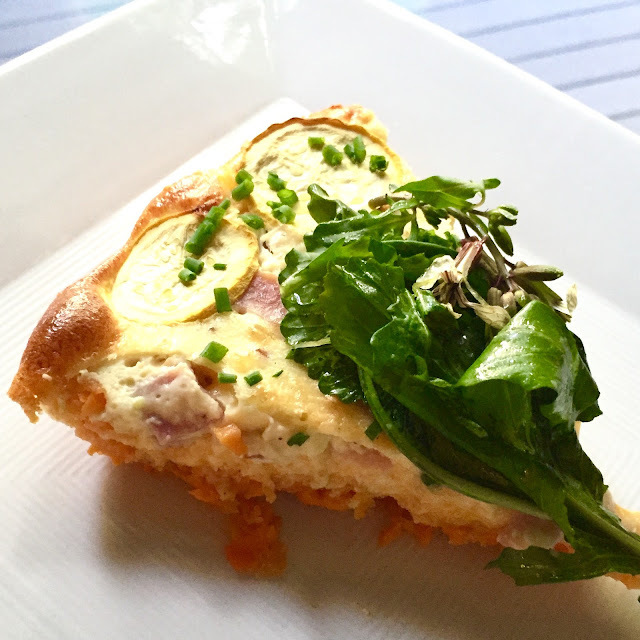 Reduce oven temperature to 375 degrees F. Bake quiche for 30 minutes or until the filling has set and no longer jiggles. Allow to cool 20 – 30 minutes for best consistency before cutting. I recently took dinner over to a neighborhood family, and made two new combinations: Goat Cheese + Sun Dried Tomato, and Zucchini/Summer Squash + Mozzarella (in addition to my tried and true Ham + Cheddar). These were the quiches before I popped them into the oven (I used disposable cake pans since I would be dropping the meal off at the house). What combination would you come up with?? So delicious! I especially enjoyed the goat cheese + sun dried tomatoes. Thank you so much! So great visiting with you and the girls! And so happy you enjoyed! This looks delicious! And such a smart crust! Umm, this looks incredible. The fact that it starts with tater tots. Definitely giving this a try. I think the key is the sweet potato version of the tots - a little on the sweet side, mixed with the savory = perfection!